Historically significant exploration map of the American West including John Jacob Astor's Astoria trading post. 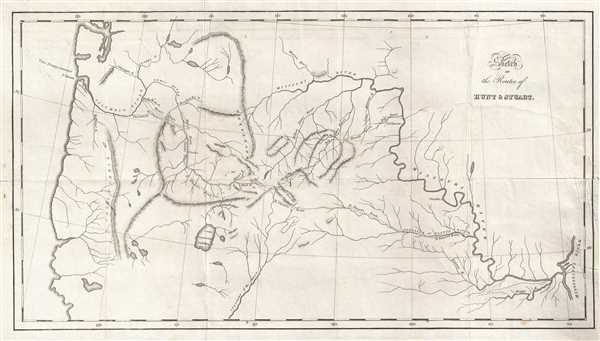 Sketch of the Routes of Hunt and Stuart. This map makes no pretense at overall geographical coverage, but for what it purports to be it is an excellent map. It has been suggested that Irving was mistaken as to some details of the Astorians' routes, and this would not be surprising. However, the map is reasonably accurate, and is an important milestone of western mapping. Both Hunt and Stuart worked for the nascent Pacific Fur Company. Founded by John Jacob Astor in 1810, the Pacific Fur Company was designed to directly compete with the English Hudson Bay Company and the Northwest Company. Astor sent two expeditions to the Pacific Northwest, one by sea on the Tonquin, and another by land, led by Hunt. The Tonquin arrived in spring 1811 and built Fort Astoria at the mouth of the Columbia River, which became the first American owned settlement on the Pacific coast. The Pacific Fur Company operated out of Fort Astoria until 1813, when the War of 1812 caused the company to close, and sell the fort and all other assets to the Montreal based Northwest Company. This map shows three of the major waypoints along Hunt's expedition. The first is Omaha, identified as the Omaha 'Big Village' where Hunt's expedition spent a few days trading with the Omaha and gathering supplies for their expedition. The second is Arikaras, where the expedition left the Missouri River and began traveling overland. Here they procured much needed horses for their expedition from the Arikara tribe. The last is Astoria, on the Pacific coast at the mouth of the Columbia River. This map portrays a critical time in American history and is directly linked to the spread of American commerce and trade. Astoria was the first American-held settlement on the Pacific coast, and this map shows a critical part of that story. This map was prepared for inclusion with the 1836 publication of Washington Irving's historical work, Astoria, or anecdotes of an enterprise beyond the Rocky Mountains. The historical significance of this map would make it an incredible addition to any collection. Washington Irving (April 3, 1783-November 28, 1859) was an American short story writer, essayist, biographer, historian, and diplomat. His best known short stories 'Rip Van Winkle' and 'The Legend of Sleepy Hollow,' both of which appear in The Sketch Book of Geoffrey Crayon, Gent. Irving was among the first American writers to earn acclaim in Europe. In 1829, Irving was appointed as Secretary to the American Legation in London, where he became the aide-de-camp. Irving was awarded a medal by the Royal Society of Literature in 1830, and an honorary doctorate of civil law from Oxford in 1831. Washington Irving returned to New York City, after seventeen years abroad, in 1832. In 1834, he was approached by John Jacob Astor to write a history of his fur trading company (colony) in the Pacific Northwest, which was published under the title Astoria in 1836. In 1842, President John Tyler appointed Irving and Minister to Spain, where he stayed until 1846, and began working on an 'Author's revised edition' of his works. In 1848, Irving was hired as executor of Astor's estate and appointed, by Astor's will, as first chairman of the Astor library, a forerunner of the New York Public Library. Irving's final work was a five-volume biography of his namesake, George Washington, which he expected to be his masterpiece. He died on November 28, 1859, eight months after completing the final volume of his George Washington biography. Washington Irving's fame never diminished throughout his life and continues to be one of the most revered American writers. He is credited as being the first American Man of Letters and the first to earn his living solely by his pen. Irving, W., Astoria, or anecdotes of an enterprise beyond the Rocky Mountains. (Philadelphia: Carey, Lea, and Blanchard) 1836. Very good. Backed on archival tissue for stability. Closed tear extending approximately 4.5 inches into the printed area from the right margin. Blank on verso. OCLC 367710892. Wheat, C. I., Mapping of the Transmississippi West, 1540 - 1861, 419.